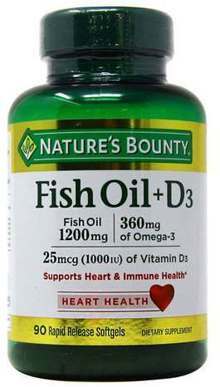 Nature's Bounty Fish Oil + D3 provides 360 mg of Total Omega-3 Fatty Acids in each two softgel serving. Warnings: If you are pregnant, nursing, taking any medications, including blood thinners, planning any medical or surgical procedure or have any medical condition, consult your doctor before use. Discontinue use and consult your doctor if any adverse reactions occur. Keep out of reach of children. Store at room temperature. Do not use if seal under cap is broken or missing. Contains fish (anchovy, mackerel, sardine) ingredients. Notes: Artificial Colors Free. Yeast Free. Gluten Free. Lactose Free. Sugar Free. Wheat Free. Fish Free. Shellfish Free. Artificial Sweeteners Free. Preservatives Free. Low Sodium. Starch Free. Recommended Use: For adults, take one (1) softgel two times daily, preferably with meals.